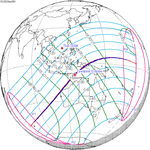 A total solar eclipse will occur on July 2, 2019 with a magnitude of 1.0459. A solar eclipse occurs when the Moon passes between Earth and the Sun, thereby totally or partly obscuring the image of the Sun for a viewer on Earth. A total solar eclipse occurs when the Moon's apparent diameter is larger than the Sun's, blocking all direct sunlight, turning day into darkness. Totality occurs in a narrow path across Earth's surface, with the partial solar eclipse visible over a surrounding region thousands of kilometres wide. 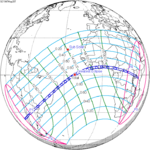 Totality will be visible from the southern Pacific Ocean east of New Zealand to the Coquimbo Region in Chile and Argentina at sunset, with the maximum of 4 minutes 32 seconds visible from the Pacific Ocean. 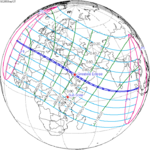 Astronomers Without Borders collected eclipse glasses for redistribution to Latin America and Asia for their 2019 eclipses from the solar eclipse of August 21, 2017. 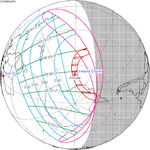 A total solar eclipse will cross this region on December 14, 2020 just 531 days later. 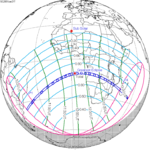 Totality will be visible in a large portion of Coquimbo Region and small parts of Atacama Region. Cities in the path include La Serena, Coquimbo, La Higuera and Vicuña. Totality will be visible in the provinces of San Juan, La Rioja, San Luis, Córdoba, Santa Fe, and Buenos Aires. Cities in the path include San Juan, and Río Cuarto. Totality will be visible from Oeno Island. There will be partial visibility in Tahiti and Bora Bora. Note: Partial solar eclipses on February 15, 2018, and August 11, 2018, occur during the previous semester series. It is a part of Saros cycle 127, repeating every 18 years, 11 days, containing 82 events. 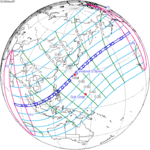 The series started with partial solar eclipse on October 10, 991 AD. 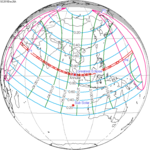 It contains total eclipses from May 14, 1352 through August 15, 2091. The series ends at member 82 as a partial eclipse on March 21, 2452. The longest duration of totality was 5 minutes, 40 seconds on August 30, 1532. ^ Cooper, Gael (2017-08-22). "Wait! Dig those eclipse glasses out of the garbage Here comes the sun. Astronomers Without Borders will be collecting the protective eyewear for use in future eclipses worldwide". Retrieved 2017-08-27. ^ "Solar Saros series 127". NASA Goddard Space Flight Center. NASA. Retrieved 2 November 2017. This page was last edited on 13 March 2019, at 22:59 (UTC).